With the ever increasing importance of guest reviews for online success, it is more crucial than ever to manage your property’s online reputation, and to make sure as many guests as possible are leaving reviews on the many popular review websites. Guest reviews can impact reservations in two major ways. First, potential guests read reviews and make decisions based on peer comments. Second, search engine rankings are affected by frequency and quality of reviews. In our ongoing effort to keep clients informed on best practices for online success, the Social Media team at Milestone has created a simple how-to guide for helping to increase the quality and quantity of online guest reviews, as well as what common pitfalls to avoid. Click here to download the PDF | Click here to Tweet! In order to grow positive reviews, actively seek out people on social networking websites (like Facebook and Twitter) who are already willingly sharing their experience with friends and strangers alike. Ask for them to share their feedback or thank them for their comments, and direct them to a specific review website if necessary. While not every guest has a web-enabled smart phone, those who are most active online often do. Many of these guests are also likely to have seen a Quick Response (or QR) code before, which allows for users to scan a unique image which will automatically send them to a website, like a mobile-friendly reviews page on your site. Put this QR code on your receipts, paperwork and marketing collateral, with brief instructions on what it is. One of the most common strategies is to ask guests to rate their stay in a post-visit email. Politely asking guests to share their feedback in a concise email message is a simple and effective method. It might sound like a no-brainer, but the simplest method is often one of the most overlooked: asking. Directly asking guests for their opinion during face-to-face interaction and then directing that sentiment to an online medium is a powerful way to grow your online reputation. 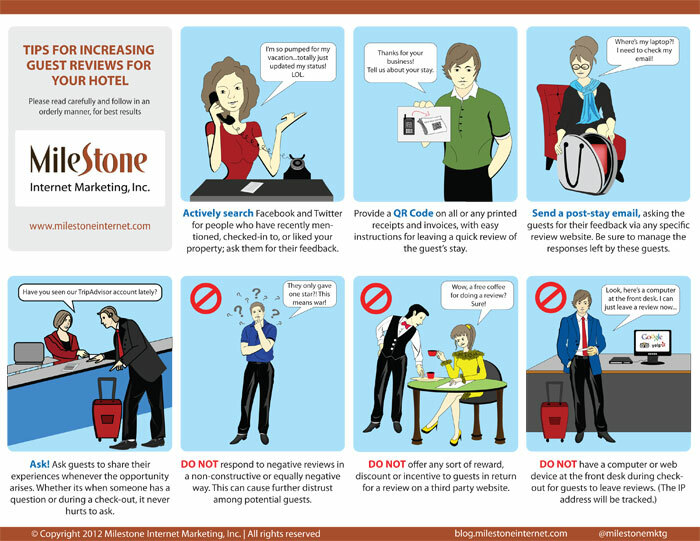 Many review websites allow hotel management to publicly or privately reply to guest reviews. It’s a great feature, but when you do have a disgruntled or unhappy guest leave a less-than-favorable review do not respond to the person in a negative and/or unconstructive way. Combative replies can damage your reputation and cause distrust among would-be guests. Instead, try to address the issue at the heart of the comment, and offer to follow up with the disgruntled guest offline. One tactic that has been tried by some hotels to inflate the positive reviews has been offering some sort of reward or incentive to guests to do so. This practice is frowned upon by review websites, and if revealed, can lead to penalties against your site’s listing. Lastly, do not have a computer station set up for the purpose of having guests leave reviews. Many review sites track the IP address of users leaving reviews as a way to ensure that one individual is not leaving multiple false reviews under different accounts. Having too many reviews come from the same computer could result in a review site banning the reviews. IP addresses have killed scams and spamming, a great thing for todays world. It is interesting how important guest reviews are for the hotel industry. Usually when people are traveling a long distance and they’re going to a city they’ve never been to, they rely heavily on guest reviews. Thanks for sharing helpful tips! Now a days people read more reviews about your hotel and then decide to stay. I think your suggestions are very helpful to get more reviews from our guest and from that we take more advantage to attract new guest.